NEW! 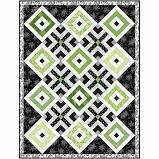 Greenery - Quilt Kit - Maywood Studio - green, grey, black, white - Quilt Market Release! Designed by Rachel Shelburne for Maywood. Finished size: 64" x 84". Kit includes quilt top fabrics & binding.